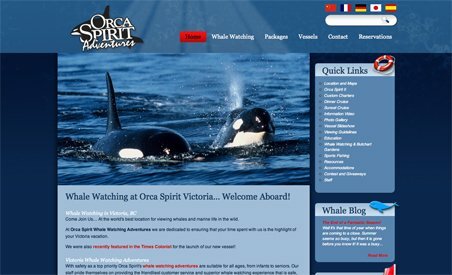 Orca Spirit Adventures is a whale watching tour company based out of Victoria, BC– the world’s premiere location for viewing marine life in the wild. From April until October, Orca Spirit offers three-hour tours in the Juan de Fuca and Haro Straits. During these peak viewing times, passengers have almost a 95% chance of spotting an orca. In addition to orcas, it’s also common to encounter other forms of marine wildlife, such as seals, porpoises and even other types of whales. Orca Spirit’s vessels range from the exhilarating Zodiacs to heated, covered boats. Orca Spirit Adventures is a whale watching tour company based out of Victoria, BC– the world’s premiere location for viewing marine life in the wild. From April until October, Orca Spirit offers three-hour tours in the Juan de Fuca and Haro Straits. During these peak viewing times, passengers have almost a 95% chance of spotting an orca. In addition to orcas, it’s also common to encounter other forms of marine wildlife, such as seals, porpoises and even other types of whales. Orca Spirit’s vessels range from the exhilarating Zodiacs to heated, covered boats. Their tour operators are qualified, knowledgeable and adhere to the strict guidelines of the Pacific Whale Watch Association. In addition to practicing responsible whale watching, a portion of Orca Spirit’s proceeds help sponsor local marine research programs.